Coming in July the NEW 2019 Pumpkin Heroes pack. Bookmark this page, add a reminder to your calendar and come back soon when Patch the Pumpkin will be ready to share his new and exciting adventures with the children in your church and family. Pumpkin Heroes is a free pack of easy to use resources all designed to help children age 4-10 in your church and family have fun this Halloween. With Patch's new story book, cartoon film, sing-along-song, activities, crafts and games. The kids will love Patch’s NEW song. Get the music and lyrics or sing-along. Bless the kids at Pumpkin Heroes and trick or treaters to your door with a Bag of Hope from UCB, OneHope and World Vision. Each free bag includes a bible-based booklet and activity sheet. Who is Patch the Pumpkin? This Halloween, World Vision's very own hero - Patch the Pumpkin wants to take the kids in your church and family on an exciting adventure to shine God's light and love into the world. 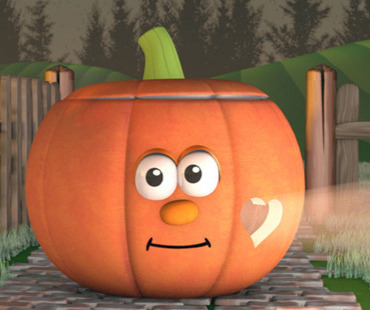 Read Patch the Pumpkin’s biography and find out what makes him so special. A Meaningful Treat is a bag of 30 Swiss Fairtrade chocolate buttons and a Challenge poster with Patch the Pumpkin too. Make Halloween more meaningful. As Christians, we understand that Halloween can be a tricky time of year - especially for Churches and Christian families. This is why we've created a Halloween alternative. Pumpkin Heroes provides you, your family and church with great Bible-based resources that will help children discover God's love for all of us this Halloween. Have you been inspired to help vulnerable children? Find out how you can: make a donation or sponsor a child with World Vision. Pumpkin Heroes was created by World Vision in 2017. Previously Carve a Heart encouraged people across the UK to carve a heart in their pumpkin to turn it into a lantern of hope. This year our hero Patch the Pumpkin is all about heart too - helping children in the UK to have a hope-filled Halloween discovering how they can help and care for others.